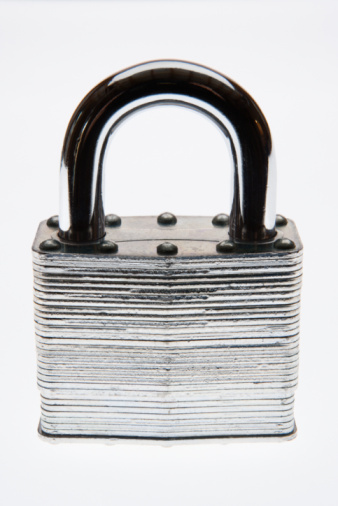 Padlocks were first invented and used back in the ancient days of Rome and Greece. Use padlocks to protect a wide variety of objects such as lockers, lock boxes, gates, fences, and even some types of suitcases. Padlocks come in two different styles. One style uses a spinning combination to unlock it and the other type you open with a key. If you should forget your combination or lose your key, you may have to break the padlock in order to remove it. Padlocks can be broken by using a chisel and hammer. Put a chisel on top of the padlock's body. Use a hammer to strike the chisel repeatedly until the body of the lock busts and the U shaped portion of the lock releases from the body. Use bolt cutters to break your padlock. Open the cutters and place them around the U-shaped part of the lock. Close the cutters and apply pressure until they cut all the way through the U-shaped part of the lock. Attach the metal cutoff wheel to the angle grinder. Turn the grinder on and apply the blade of the grinder to the U-shaped portion of the padlock. Wear proper eye protection to prevent metal shavings from entering your eye. Michael Cantrell is a freelance writer and musician from Piqua, Ohio. He has been writing professionally since 2007. In 2008, Cantrell was a full-time employee with an SEO company named Words You Want. He has a diploma from and is currently attending Edison Community College with a major of criminal justice. What Are Channel Lock Pliers Used For?